Toadie congratulates Evan on whatever he just won. A Logie for ‘Most Uninteresting Character' perhaps? Whatever it is, Evan and Maggie are very, very happy, which makes Toadie very, very sad. Evan's stunned he won at all but Susan urges the “councillor” to make a speech. Something politics-related then. Oh, and Susan? BAD IDEA! Evan blathers on and on about being the best councillor dude he can be and everyone claps because they're excited he stopped talking. 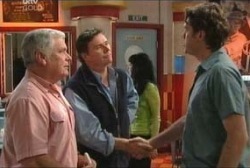 Matt congratulates his dad as Toadie bundles him off to get a beer, hopefully filling him with enough ale to make him fall into a drunken stupor and become absent for the rest of the episode. Michelle consoles her dad who has just heard the news that Evan bet him in the running to be councillor. I'd be depressed too, Joe. He's worried that with Evan on the council the developers will lose their backers. Michelle tells him to look on the bright side; perhaps Evan could be Joe's “environmental liaison man”. Joe's extremely underwhelmed by this. Michelle apologises, but thinks that sometimes you just have to follow your principles. Joe warns that sometimes following your principles comes at a high price. Dee and Toadie talk shop about the election. Zzzzzz… Matt swings by to check on Toadie as Dee leaves, wanting to know if he's okay, “I'm just a bit worried about you, y'know, back at the party.” Toadie repeatedly insists that he's fine, making it blatantly obvious he's not when Matt asks if his weird mood has anything to do with Maggie. ‘Of COURSE not! My SHIFTY looks and QUICK response is giving nothing away about my crush on your stepmum!' Matt presses on and wonders if they had a falling out at work but Toadie insists that everything's cool, suggesting they have a beer. Toadie, my new hero. Taking out the Hancock family one by one with alcoholic beverages. We'll reconvene when we get to the young ‘uns. This is so bizarre watching ghostly Drew and Dee interact in a demolished set. Oh, and if you're reading summaries in numerical order – SPOILER ALERT. Anyhoo, Dee is smilingly berating Stu for working on Matt's car in the street; it's the noisiest thing she's ever heard. Drew dashes in to save the day, offering to help Stu tune it later on. Dee leaves for work while Stu checks her out. Ah yes, Stu's crush rampage through the laydeez of Ramsay Street, ‘Operation D'. Evan walks in… ah, dangnabbit. Lou congratulates him on his win. For the love of God, offer him a free beer, Lou. Joe also saunters in and offers an awkward handshake to his neighbour. Lou scurries off leaving Evan to bumble his way through an apology but Joe's fine, “all's fair in love and politics, ay?” Joe asks if Evan's still planning on blocking the new development to which Evan says he is; it's what his platform was all about after all. Joe's one unhappy camper. Can't wait to see you at the Dance-A-Thon, Scully, Everyone reckons you're the easiest chick at Erinsborough High. Matt and Toadie argue about the noise level of Matt's go-go mobile when there's a knock at the door. It's Maggie asking if Toad wants a lift to work. Toadie practically stands on top of her whilst he eats the rest of his toast in her face. Smooth, Toad. And wow Maggie's voice is high. Toad eventually says yes while Matt reneges the offer, he's got his own wheels, man. Before they leave though, Mags notices some toast crumbs on Toad's face and brushes them off. In Toadie's mind, they're now engaged. “Isn't it amazing how boys never stop needing their mummies around?” Maggie muses high-pitchedly. Ooh, BURN! Toadie looks suss as Matt gets a strange look on his face… his brain too dulled by beer to make the big connection. Michelle is heckled by some random extras and even wolf whistled at, all because of the smarmy note. Susan walks by, not to give the hecklers detention but to remind Michelle to call maintenance next time her locker's stuck. Nice work, teach. Ellie sidles up to Shell and lets her know she knows who the note writer is, but Michelle isn't going to like it. It's Zack. Toadie stares at the back of Maggie's head in a totally non-stalkery way while she answers the phone… high-pitchedly. “Cox and Associates, Maggie Hancock speaking.” What a rude law firm they convene in. Judging by the phone call it seems as though Cox and his Associates can't be bothered coming into work so they've left Mags and Toad in charge, as Mags so dutifully tells Toadie right in his face like she's going in for a pash. No wonder the poor boy's confused. Toad is just about to ask her if she wants to wear his promise ring and go steady… or something, when Meredith the sandwich chick arrives. Mags thinks Toad has a crush on her so she makes a big scene about Toadie ordering some lunch. Turns out Meredith is about as delightful as a hernia – I can't see why she's still on the dating scene… Yeesh. Dee is suspicious when Drew and soon-not-to-be-Chooka walk in with a camera. Chook-Stu explains that he likes to keep a photography journal of whatever takes his fancy; today it's the Coffee Shop and, funnily enough, Dee. Dee smiles that she'd love to see his work sometime. Michelle can't believe that Zack's turned out to be so cruel, she can't work him out. They didn't even do anything ‘raunchy' together so she's got no idea why he's being such a tool. Ellie tells her not to sweat, she's got a plan. Joe walks in and ignores Evan who tries to speak with him. GO JOE! He lets Michelle know that he and Lyn are working late that night so she's to have dinner then get straight into homework. Whatever, Joe. Then he adds the priceless, “No going out,” which is a huge arse invite to go out if I've ever heard one. Michelle sooks that her dad hates her. Oh dear. Mags is taking her sweet time choosing a sandwich from Moaning Meredith. Mags is trying to stall so Toad can score some more alone time with the charming woman, talking up his good points, but I think Toad would rather eat his own toenails than chat to her again. Moaning Meredith barges off as Mags tells Toad she thinks it went well, “she seemed keen.” Obviously we've gotten the alcohol into Mags since she's so delusional. Awesome. Toad weakly gives her a thumbs up. Evan asks for a word with Matt and even his own son doesn't want to talk with him. You get that, Evan? Go and eat worms! Evan blathers on though as he's prone to do, telling Matt that he shouldn't shut Genevieve (Matt's mum) out of his life; he's hurting the family by doing so. Matt isn't buying it however, he doesn't want to sit and beg every time Genevieve snaps her fingers. “I'm perfectly happy to have a relationship with her but not just on her terms.” Evan tells Matt they miss having him at home, would he consider moving back? Escape while you can, Matthew! Evan wants Matt to think about it. Chooka-Stu and Dee sit cosily on the couch whilst they browse through Stu's picture journal. She admits he's got an eye for composition. Stu says that every thing in that album means something to him – we're treated to scintillating pictures of a beer bottle and a fridge. Wacko. Dee sees a woman that keeps reappearing in a lot of pics and asks who she is, but all Stu will reveal is that she's a “good friend”. Hmm, a former fiancée perhaps? He asks Dee if she's ever been in love to which she replies she hasn't – except when we found out she used to be married I guess. Ooh, SPOILER ALERT for all you numerical order summary readers out there. Aren't you glad I keep a lid on things? Dee says she's looking to the future as Stu takes a pic of her. The romantic music in the background tells me there's going to be some pashing in their future. Mags finds Toadie hiding out from her, but he tells her he was just working through a case. Oh Toad, you know you can't hide from your feelings. This is Neighbours! Maggies smirks and tells him it's time to confess, it's obvious, “you were thinking about Meredith, weren't you?” Ah yes, Moaning Meredith and her scowling features, her sassy attitude. What a catch. Toadie, of course, says Mags' on the money. He bemoans the fact Meredith may have a boyfriend but Mags tells him not to give up hope, placing her hands over his. Woman, would you stop giving this poor boy mixed signals! He's going to be picking out a wedding tuxedo soon! MAGGIE: If you heart's set on someone you must give them everything you've got. If you've fallen for someone, no one else is ever good enough. You must be true to your heart; you must be true to your feelings. Promise me you will? Oh irony anvils, I have missed you so. Toadie promises and tries not to vomit from being so nervous. Michelle and Ellie are trying to think up a groovy scheme to get Zack back but are interrupted by Susan walking in the door. Geez, Suse, you think you live here or something? She asks the girls why they look so guilty but they give her some lame response, which she accepts for now. Michelle makes a hasty exit home – right after Susan asks if she's going to be in the dance marathon next week. That sounds peachy, Suse. Ellie tells Shell she'll catch her later for that thing. You know that thing that makes us not sound suspicious at all? Yeah, that's the one. A security guard, with the noisiest shoes ever (like way to go being stealthy walking down the hall trying to spring intruders), bumbles around with a flashlight. Ellie and Michelle sneak in while he's occupied elsewhere as the music of would-be crime chicks plays in the background. Michelle starts to scrawl something on the blackboard with the loudest chalk on earth. They hear the footsteps of the guard walking in from China. Michelle looks scared and Ellie tries to… hide in a locker? Oooookay.